Duval Paving, LLC is fully qualified and experienced recycled asphalt millings contractor serving the area. Having been in business since 2011, Duval Paving, LLC has the expertise and equipment to complete your smallest or largest tasks. Yes, Duval Paving, LLC is fully trained and equipped, but what is recycled asphalt millings? Recycled asphalt millings is old asphalt ground into gravel and is most often compacted, which can then bind together forming a beautiful, durable, cost effective driveway or parking lot. Environmentally Friendly - Because asphalt is not biodegradable, any waste from it accumulates in landfills and remains there. Recycled asphalt millings allow for old asphalt to be reused. In addition, it cuts down on the pollution being created during the production of new asphalt. Adaptable to Weather - Whether you live in a warm climate or cold, surfaces paved with asphalt millings are durable enough to withstand heat, rain, snow or ice. In fact, in heavy rain, water will not pool, snow will melt faster, and ice is harder to form. 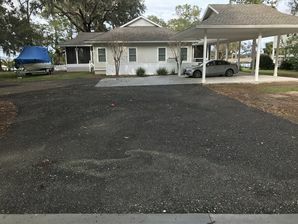 Maintenance Free - A driveway, parking lot, or stretch of road paved with asphalt millings will require no sealcoating, resurfacing, or replacing. As a matter of fact, over time, asphalt millings strengthen rather than weaken, making it a superior product. Affordable - Because asphalt millings is a recycled product, the raw material cost is drastically lower. Aesthetic - Once the asphalt millings become hard, the end result can add tremendous curb appeal to your home. For more information on recycled asphalt millings, or for your free estimate, call us today at (904) 201-2161. We are always happy to serve the area residents and businesses.